When thinking about what Identification system you need you have to think about your needs and the size of your business. Here, at photo ID Systems we put the systems in three categories to give an idea of what system might be right for you. Might only need a low capacity system. A restaurant is doing a great job. The food is great and people talk about the place the whole time. It�s on the map and is starting to get real recognition. The restaurant wants to start to launch its Friday spectacular events. The restaurant wants to send VIP cards so the front of desk knows who�s who and where they should go. Additionally the management of the restaurant as well as their families who also need ID passes. These two groups might get two different cards with identifying information. There are four machines that meet the needs for a smaller business. 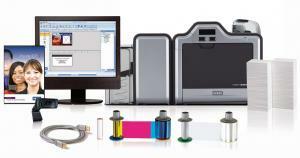 The Evolis Primacy single sided ID card printer is a high-end ID card printer that is easy-to-use, flexible and fast. The Primacy comes standard with ethernet connectivity. 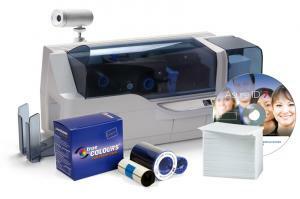 Its fast, producing 210 cards per hour for one side, and 140 cards per hour for dual-sided printing. This flexible printer can also be fitted with additional options at any time, when magnetic and contact/contactless encoding are required. Primacy is the very first printer in its category to offer this level of performance through such a compact size and footprint. The printer also ensures great printing quality. The energy consumption is on average 5 times lower than printers from the previous generation. 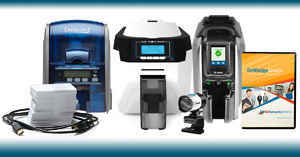 The printer benefits from the ENERGY STAR certification, is compliant with the ErP directive and is a quiet machine. 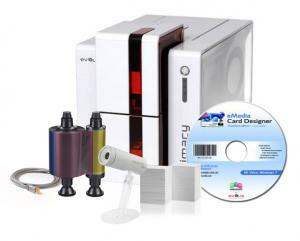 Tthe system comes with a Asure ID Solo 7 ID Card Printer Software, Fargo Full Color Ribbon YMCKO that can print 250 cards, 500 White PVC Cards and a Credential Camera. 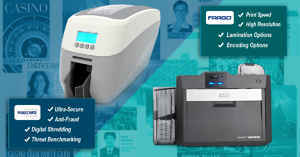 The Fargo DTC1000 dual-sided printer is a simple machine to use to produce high quality single sided photo ID cards. The DTC1000 user focus design makes it easy to setup, load and operate. You can easily rewrite the cards after use so it becomes a cost effect and eco-friendly system. The Fargo DTC 1000 is a small machine and great for any office. The Fargo DTC 1000 has an option to print dual sided cards remaining true to producing high sharp professional id cards. The dual sided printing option can create ID cards more informative with information on both sides. The system is very easy to use from setting up the hardware with its components to using the software to produce the cards. It�s a little pricier than the Evolis but the Fargo pays for itself with the system it offers. Comes with Zebra ZXP Series 3 Dual-Sided ID Card Printer, a Zebra Full Color Ribbon that can print 200 cards, Credential Camera-CCAM, Asure ID Solo 7 Software, 500 White PVC Cards, USB, cable, Power cord, Microsoft Windows drivers and a 2-year warranty. 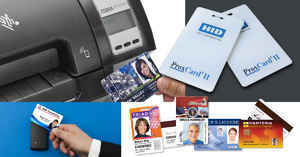 This system is a comprehensive solution to design and print high-quality ID cards and badges. The Zebra ZXP Series 3 printer produces with color dual-sided badges at a at a fast production rate of 140 cards per hour. 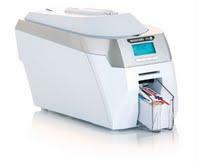 This card printer is equipped with a 100-card covered feeder allowing you to print 100 cards at a time. Zebra's ZRaster� host-based image processing technology insures that the print quality of your cards always meets a high standard .The ZXP Series 3 card printer supports a wide range of cards. For security purposes, the printer includes a Kensington� secure lock slot. The Asure ID Solo software is a great program for small businesses looking to create affordable yet professional looking ID cards. Might need something a little more robust. A medium sized and growing gym has hundreds of membership users and with an emerging client base, looking to expand to other locations. The gym is great place to work out with great views of down ton Manhattan and the marina. Its exclusive feel together with its great range of exercise machines is bringing in clients and the new range of exercise classes is promoting this gym with great results. 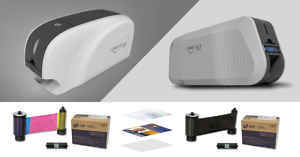 Comes with a Magicard Rio Pro Dual Sided ID Card Printer, Asure ID Solo 7 ID Card Printer Software, Magicard full color ribbon that can print 300 cards, 500 White PVC Cards and a Credential Camera. This machine is really set up for a professional environment, the Rio Pro has a very good printing quality comes with a full range of options. You can easily print single or double-sided printing, you can print in a batch or one-off card printing and the printing provides a range of secure encoding with magnetic stripe, bar coding, contact and contactless technologies. It comes standard with HoloKote but has an option to customize the system to an individual design. It has a 100-card holder & 70-card stacker for batch printing plus hand-feed slot, Built in USB and Ethernet connection. Is built with genuine HID technology. It can work alongside other products in the HID eco-system enabling you to leverage your existing technology. 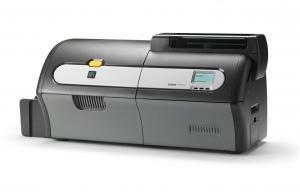 The Fargo DTC4000 is an enhanced secure printer. In addition to its sophisticated encoding options the FargoDTC4000 dual sided printer can print a UV layer for an increased level of physical security on the card. Even with all the security features it is still a sleek and a compact printer. 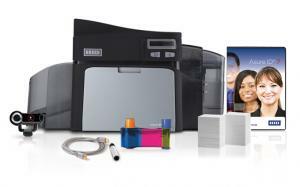 The printer produces professional quality color ID cards and security encoding. He printer can handle all level of secure encoding. TheDTC4000 can also be password protected at the printer so only approved operators can print and encode plastic security cards and badges. may need volume and speed in a machine that can really manage the logistics. Organizes a number of industry exhibitions a year. Its big exhibitions bring in hundreds of exhibitors each bringing 5-10 people to support their booth that required a large amount of id cards. With its other niche events at other times during the year the organizers need to produce thousands of identity cards with many different information. The machine needs to keep up with the job. A different arrangement altogether is government or private agencies. The information in this organization is very sensitive and it would be of great concern if people that should not get to view this information did have access. The seriousness of the security detail in this organization is such that failure in the security would be a severe case that would be a public incident. It is clear then that everyone would be required to have an id card at every level of entry from the high level entry to a business that might provide paper supplies on a regular basis all require identification. Some might require more information recorded on their cards than others. 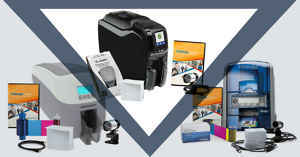 Comes with a Fargo HDP5000 Dual- Sided ID Card Printer, asure ID Solo 7 ID Card Printer Software, a full color ribbon that can print 500 cards, Fargo Clear HDP Film that can be applied to 1500 prints, 500 White PVC Cards and a Credential Camera to print IDs. The Fargo HDP5000 Dual-Sided ID Card Printer is the ideal solution to print great, high-definition cards. The enhanced HDP5000 produces ID cards to high image specifications, it does this by printing a reverse image on the underside of HDP Film this image is then fused to the cards surface. Since the print head never comes in contact with the cards it never gets damaged and it carries a lifetime warranty. The printer itself comes with a 3-year warranty including one year of free printer loaner support. A protective layer of HDP Film is placed on the card image protecting it from the elements. A great security feature is a tamper-evident technology securing the card from counterfeiters trying to peel apart the layers, in that instance the image essentially destroys itself. The system is fully modulated to be expanded with system add-ons. The Asure ID Solo software is a perfect solution for businesses looking to create affordable yet professional looking ID cards. Easy-to-use, your ID cards will look just the way you want them to. The machine able to be upgraded Dual card input hopper module with 200 card total input hopper capacity and 200-card input hopper cartridge with lock. There is an ability to manage both single-side or dual-sided simultaneously. A lamination module can be added as well as magnetic stripe, smart card and contactless encoders. Can capture your ID photos and then design and print high-quality ID cards. 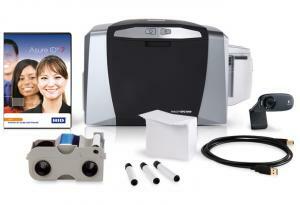 This ID card system is packaged with everything that you need to print IDs within minutes. 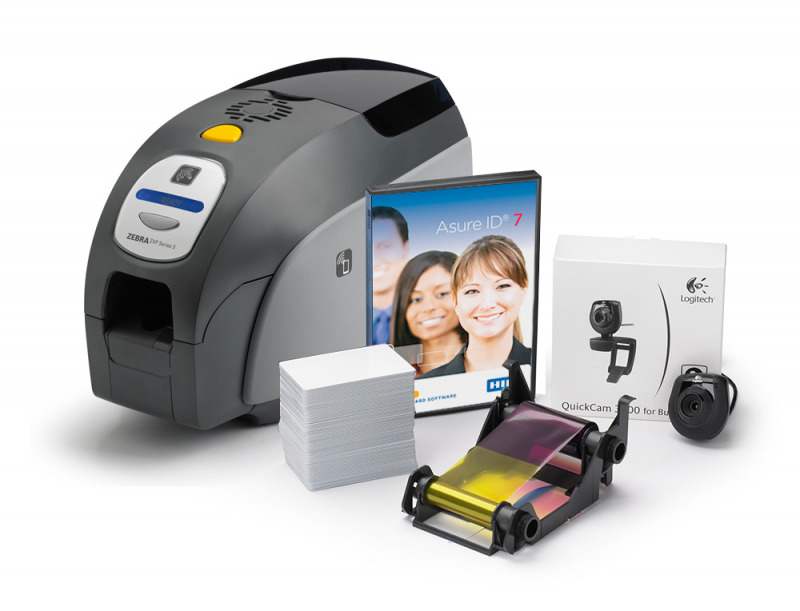 This system comes with the Zebra ZXP Series 7 Dual-Sided ID Card Printer, a credential camera CCAM, the full-featured Asure ID solo software, a color ribbon and PVC cards. The Zebra ZXP Series 7 card printer generates high quality photographic prints with great color depth using Zebra�s photo-print technology. The system can be upgraded to code magnetic stripe, smart card and contactless cards.